The forever forward incremental backup method produces a backup chain that consists of the first full backup file (VBK) and a set of forward incremental backup files (VIB) following it. During the first session of a backup job, Veeam Backup & Replication creates a full backup file on the backup repository. During subsequent backup job sessions, Veeam Backup & Replication copies only VM data blocks that have changed since the last backup job session (full or incremental) and saves these blocks as an incremental backup file in the backup chain. 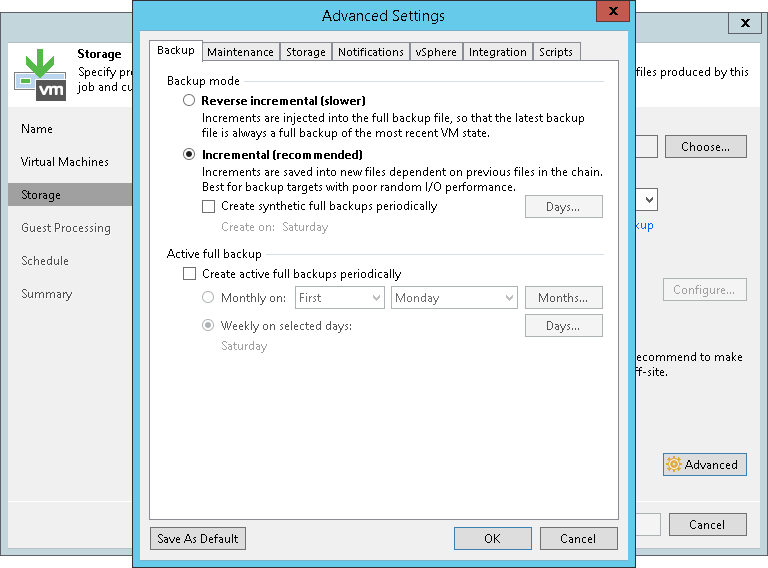 After adding a new restore point to the backup chain, Veeam Backup & Replication checks the retention policy for the job. If Veeam Backup & Replication detects an outdated restore point, it transforms the backup chain to make room for the most recent restore point. For more information, see Forever Forward Incremental Backup Retention Policy. Select the Incremental backup mode. Do not enable synthetic full backups and/or active full backups. If you enable synthetic and/or active full backups, Veeam Backup & Replication will produce a forward incremental backup chain.